Kathleen Hacker and Robert Winchcombe were my maternal grandparents. My grandmother was one of ten children and there was nothing I liked more than sitting with her and looking through her black and white photographs and listening to her stories. One of my favourites was how she met my grandfather and how Hitler tried to upstage their wedding. In 1936 Robert Winchcombe was unemployed after his apprenticeship had come to an end at the Great Western Railway Works in Swindon. He earned some money playing clarinet and 1st or 2nd Alto Saxophone in local dance bands, including the Harry Smith Band, the Moderniques, St. John’s Dance Band, and the New Georgians, who played all over Wiltshire and Berkshire. Around this time he met my grandmother at the St Barnabas Church Badminton Club. He was an altar server at St Barnabas, sang in the choir and was also a member of the Youth Group. After his death I inherited a small black engagement book for 1937-38 where he had meticulously recorded all his musical engagements as well as dates with his future wife. Their first official date occurred on the 17th of December 1937 where Robert has written ‘1st engagement with K.H.‘ It must have gone well as there’s a small ‘K‘ pencilled in on Christmas Day, as well as ‘Went to tea at K’s brothers‘ the day after. They see each other several times each week, play badminton together, attend concerts, go on church outings and visit relatives. In March Robert was given a couple of weeks work back in the Great Western Railway before they gave him 2 weeks notice during the middle of May. His engagement book then records a succession of interviews – ‘24th May Gloucester for work unsuccessfully‘, ‘28th June South Cerney unsuccessful application for work‘ and ‘21st July Colbournes unsuccessfully, Baines’ ditto‘. The engagement book ends on the 4th of September 1938. Fortunately I’m able to fill in the gaps which give the story a happy ending. Robert Winchcombe eventually got a job at the Gloster Aircraft Factory in Gloucester, presumably soon after September 1938, and he and Kathleen Hacker were able to get engaged. They were married four days after war was declared, their wedding plans hurriedly changed as the church hall was requisitioned, and started married life in Churchdown, Gloucester. 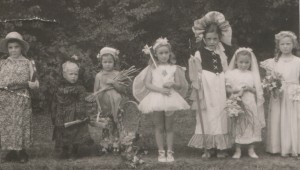 Black and white photograph of a group of children in fancy dress. My grandmother made all my mother and aunt’s clothes and I have many photographs showing them in knitted swimsuits, Sunday best and fancy dress. 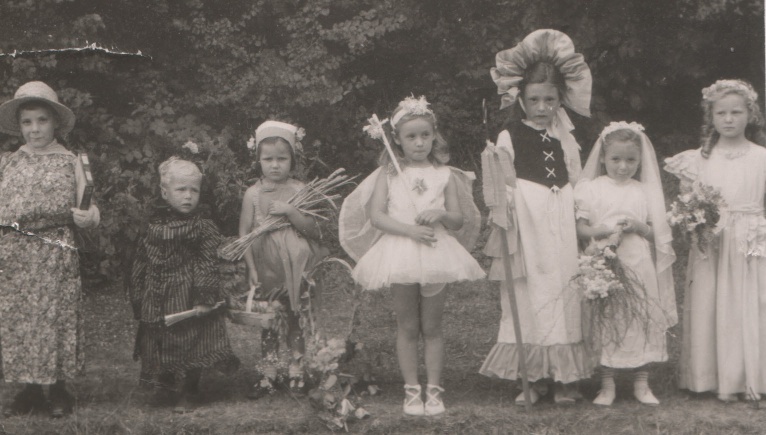 My mother, third from right, is dressed as Little Bo Peep. My aunt, second from right, wears a wedding dress. Taken around 1945 in Swindon. I have so many photographs of my mother and aunt in similar situations. They really make me smile as I’m currently experiencing the same kind of events with my own young children. Writing about this image has made me feel guilty I don’t know more about the circumstances, so I’ll be asking my mother about it today! Edited – “it was taken at the St Mary’s Church, Rodbourne Cheney, Swindon, summer fair, in the Vicarage garden. It was taken with a Box Brownie, and I think it would have been in about 1948, the year we went to live in Rodbourne Cheney. I wore my Little Bo-Peep costume that I’d previously worn for the Victory street party at the end of WWII, but I’d grown a bit, so Nanny put a frill on the bottom to make it long enough. Pauline was a bride, but neither of us won the prize. I was 7, Pauline was 3. I had a quick look in some of my boxes of treasures today. 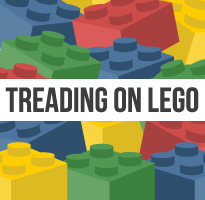 I’m sure we all have them. Boxes of items kept for sentimental reasons. As well as my boxes of photographs and certificates I have two boxes of treasures which include letters, framed photographs, books with written inscriptions, medals, coins and jewellery. I feel quite lucky to have these ‘extras’ as they all help build up a picture of my relatives. They are great clues to expanding knowledge further than just dates provided by certificates and census returns. Two of my favourite items are a diary belonging to my maternal grandfather. Although the diary records the dates of the gigs he played in, it also mentions his first dates with the woman who became my maternal grandmother! I also have a diary written by my maternal great grandmother, dated with lots of family news even though she mainly records which of her many children visited that day. 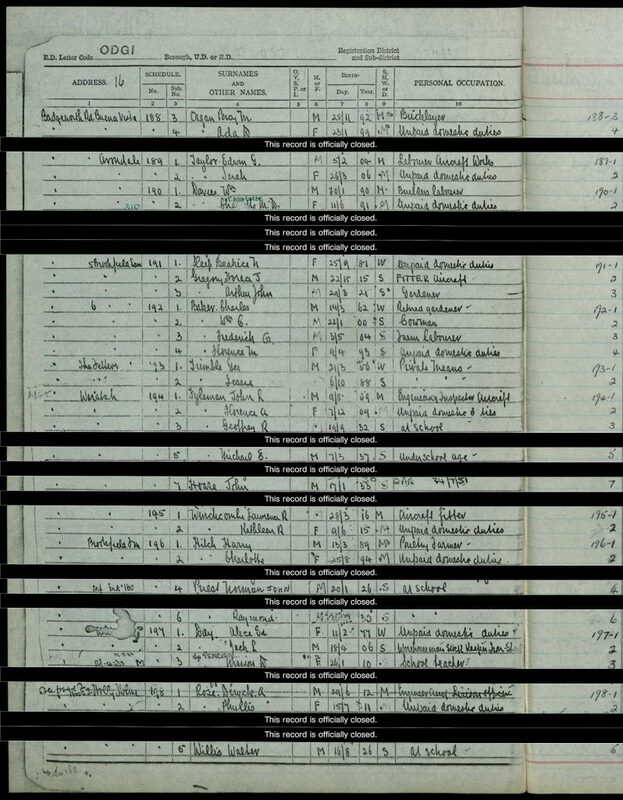 I will transcribe both and add them here (time permitting). 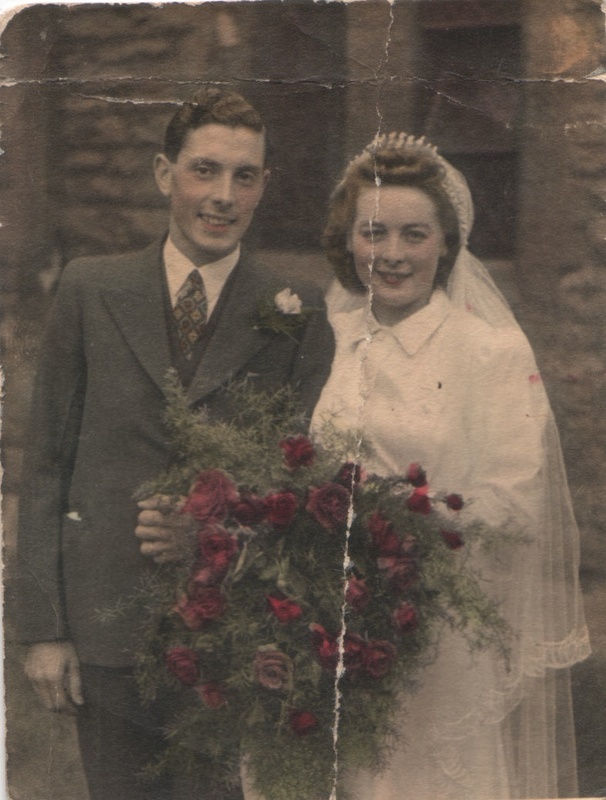 This is a lovely tinted photograph of William (Bill) Winchcombe and Frances Day on their wedding day 25th August 1945. He was the younger brother of my grandfather, Robert Winchcombe. I presume this was taken at St Barnabus Church, Swindon.